We are told that austerity in Europe has failed. The elections in France and Greece, for instance, are supposedly evidence of people’s opposition to severe cuts in spending. However, the growing anti-austerity backlash in Europe ignores one fundamental point: If there is austerity in Europe, in most cases it hasn’t taken the form of massive spending cuts. The following collection of charts shows the extent to which certain countries in Europe have participated in “austerity” measures. Using different measures of government spending from the European Commission’s Eurostat and the Organization for Economic Cooperation and Development (OECD), the data show a reoccurring trend: While a few countries have reduced spending by slight amounts, most have not. Furthermore, the unseen (and less talked about) tax hikes and increased regulatory burdens continue to augment the façade of austerity in the Eurozone. 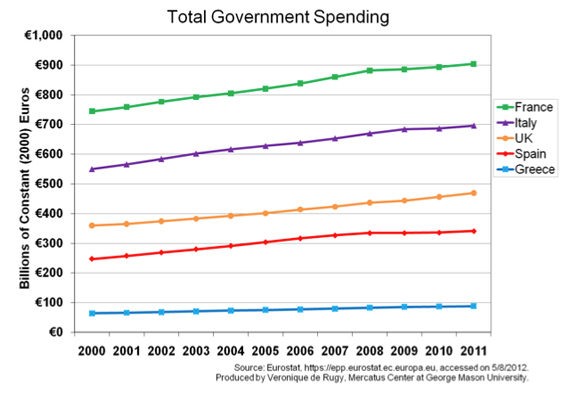 The chart above shows government spending for various Eurozone countries from 2000 to 2011. Following years of large spending expansion, Spain, France, the United Kingdom, and Greece—countries widely cited for adopting austerity measures—haven’t significantly reduced spending since “austerity” supposedly started in 2008. France and the United Kingdom have not cut spending. When spending was actually reduced—between 2009 and 2011 in Greece, Italy, and Spain—the cuts were relatively small compared to the size of their bloated European budgets. While Italy reduced spending between 2009 and 2010, it also increased spending in the following year by an amount larger than the previous reduction. The same is true for Ireland, where spending in the country went down between 2010 and 2011 by €27.9 billion after going up by €25.7 billion the year before. That’s a miniscule €2.2 billion drop from 2009 to 2011. Most important, meaningful structural reforms were seldom implemented. Whenever cuts took place, they were always overwhelmed with large counterproductive tax increases. This so-called balanced approach—some spending cuts for large tax increases—has been proven to be a recipe for disaster by economists. It fails to stabilize the debt, and it is more likely to cause economic contractions. 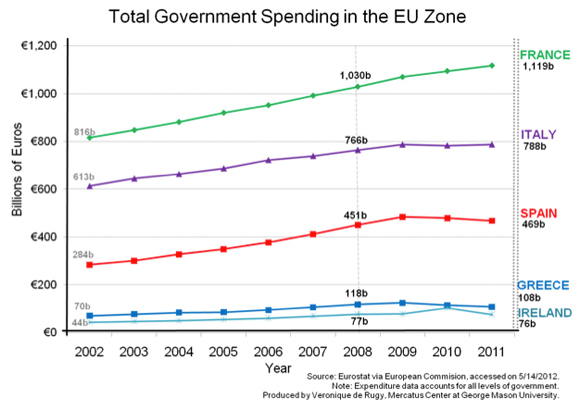 This version of the previous chart uses data from the European Commission’s Eurostat to show total government spending in real terms from 2000 to 2011. It is important to note that inflation hasn’t changed much in the past three years. Again, after the data is adjusted, we see that spending increases are the norm rather than the exception. This is evidence that nominal spending is what matters in the short run. The real question to be addressed is how bad spending cuts have been in nominal terms. 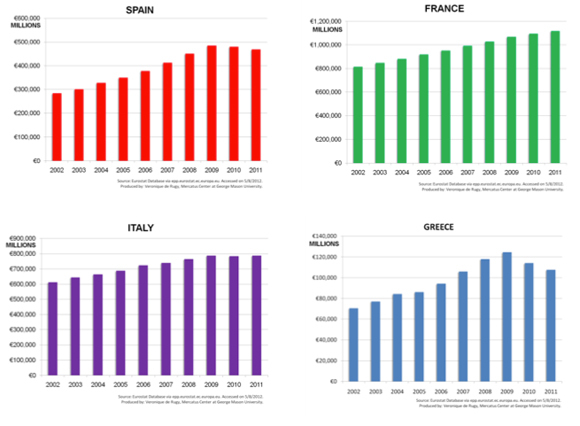 The charts below show the profiles of European countries’ spending patterns to assess the magnitude of change in real government expenditures between 2002 to 2011. 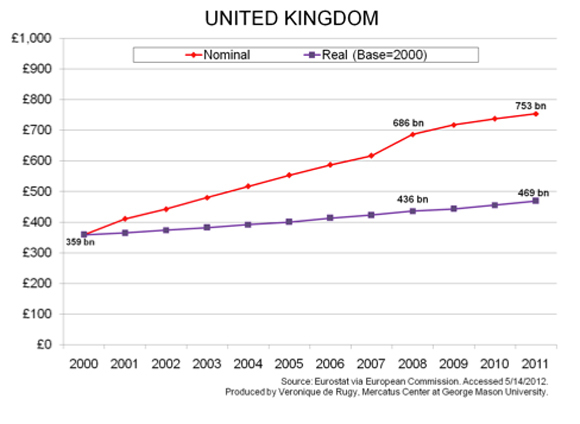 The data showing the United Kingdom’s government spending is presented in nominal and real pounds from 2000 to 2011. 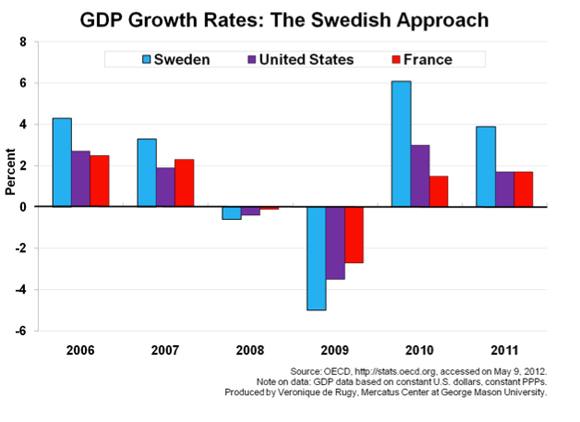 This chart uses GDP growth rate data from the OECD to illustrate the magnitudes of economic growth in Sweden, the United States, and France from 2006 to 2011. The three-country comparison highlights that, while each recorded negative economic growth after the recession, Sweden not only took the largest hit but also experienced the largest rebound by 11 percent (from –5 percent in 2009 to 6.1 percent in 2010). By contrast, Sweden has significantly cut government spending without equivalent increases in taxes. Sweden’s finance minister, Anders Borg, successfully reduced welfare spending and pursued economic stimulus through a permanent reduction in the country’s taxes, including a 20-point reduction in the top marginal income tax rate. As a result, Sweden’s economic growth has, of late, trumped every other European country’s. Sweden’s commitment to reform has paid off in economic growth. While the debate over austerity continues, the evidence suggests that austerity can be successful so long as it isn't modeled after the so-called “balanced approach.” Other European countries and the United States should take heed and stop succumbing to the lure of an easy answer—to close budget gaps with higher taxes. The “balanced approach” has proven a recipe for disaster. In a 2009 paper, Harvard University's Alberto Alesina and Silvia Ardagna looked at 107 attempts to reduce the ratio of debt to gross domestic product over 30 years in countries in the OECD. They found fiscal adjustments consisting of both tax increases and spending cuts generally failed to stabilize the debt and were also more likely to cause economic contractions. On the other hand, successful austerity packages resulted from making spending cuts without tax increases. They also found this form of austerity is more likely associated with economic expansion rather than with recession. 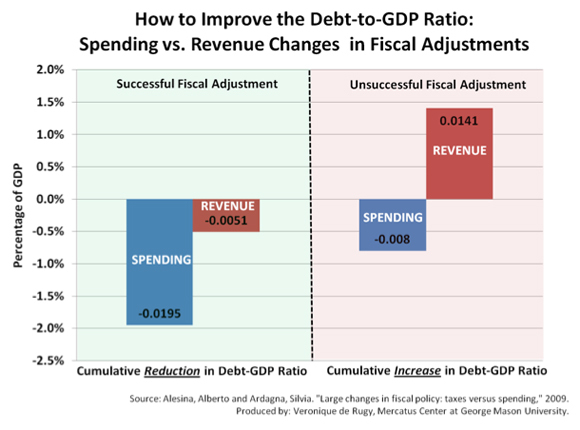 While the “balanced approach” may give the appearance of pursuing fiscal solvency, in practice it stagnates the possibility of growth. Real fiscal reform comes from a commitment to cut spending and from structural changes to taxation and the regulatory environment.